Like how there is chuck and chuck, there is aguja and aguja. Huh? Let me explain. There is chuck the primal cut which comes from the shoulder area with some of the neck and ribs included and, from this primal cut, there is a section of muscles that form what is called the chuck roll cut. (This section runs above the shoulders, along the back, from part of the neck to where the rib eye cut begins. From the chuck roll you get the roasts or steaks known as chuck eye, chuck, tender, and under blade. 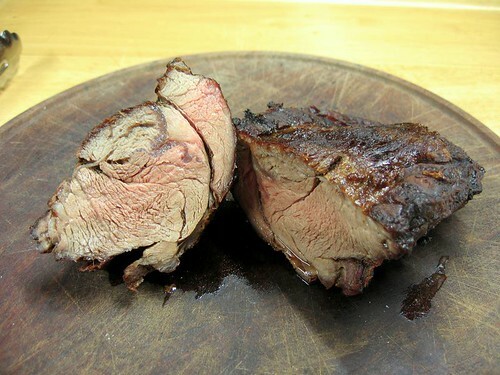 At times, the chuck roll and its various cuts are simply truncated down to chuck steaks or chuck roasts. The same can happen to other cuts within the chuck primal cut but more often than not they are labeled as their proper names such as blade roast, cross-rib roast, 7-bone roast, etc. Confusing, right? Because this muscle area gets worked a lot, the meat is rather tough and needs to be tamed with slow cooking. When many think of chuck meat they are probably thinking about stringy soft chunks floating around in a thin savory soup broth or hearty stew. Perhaps chopped up and made into a spicy chili. Maybe braised with a robust wine or smoked with a salty sweet rub. Anyway, I’m sure that a few grillers out there would not think of tossing a chunk directly over hot coals, in the open, without a top to cover or basin of water underneath. The meat would end up tough or dry, right? Well, in Argentina there are many who don’t follow that ideology. Now, I wouldn’t be surprised if the majority prefers to braise, oven roast, or stew aguja instead of giving it the parrilla treatment but there are some who do toss them over the ‘ol hot coals. Remember, this is the land of barbecuing. Where almost every kind of meat and organs, no matter how tough or tender, will somehow be tossed on a grill or skewered on a spit by someone. According to the Instituto de Promoción de la Carne Vacuna Argentina (Institute For The Promotion of Argentinean Beef; PDF file; page 21), chuck/shoulder, breast, neck, rump, leg, or any kind of “common” meat that is often used for ground beef or slow cooking makes up for about 25% of the cuts used for asados. However, I have no numbers that offer a glimpse into whether or not people very much enjoy these meats on the parrilla or if they are mainly chosen due to prices and financial reasons. Now, aguja has a good amount of fat in various spots so if you grill it right, you’ll be rewarded with a somewhat juicy slab of meat full of rich beefy flavor. How tender the meat becomes depends on skill, a bit luck, and the actual quality of the meat. Ok, that applies to every cut of beef but some cuts are more forgiving than others. However, you do need to take care with this one and some parts may remain tough but remember, in Argentina, taste can often trump the chew factor. Aguja is best cooked on the grill in “steak” form. For the closest approximation ask for beef chuck roast or beef chuck eye cut into steaks about 2.5-3 inches thick. At this size they will probably be weigh about 2.5-3.5 lbs. As with most cuts from the chuck these need to be cooked at a slow pace with medium heat. I will usually cook aguja over a layer of coals where I can hold my hand about 5-6 inches above them for 4-5 seconds. Adding extra coals throughout the cooking process to maintain that temperature. Flip the meat about every 30 minutes and it should be ready in about 1.5 hours. Baste the meat with salmuera or liquid-heavy chimichurri about every 15 minutes. The thickest section should look about medium-well in the center when time comes to serve. (first image at the top) Medium or less and the meat will be rubbery. Medium-well to just about well done is ok but anything past that will be super dry. Note: Although this is not a traditional method in Argentina, I find that salting the meat for a period of time beforehand really improves the end result. About an hour before grilling, for each side, sprinkle on about a tablespoon of coarse salt and allow to sit at room temperature. 45 minutes later, rinse the meat under running water and pat dry with a clean towel. While the meat is cooking, use a spray bottle to spray a little fresh water on the meat every 15 minutes.